These are all recent repairs I have attended with the reported fault and solution. PLEASE NOTE THIS IS FOR INFORMATION ONLY - ALL REPAIRS SHOULD BE CARRIED OUT BY COMPETENT PERSONS (FOR GAS - GAS SAFE REGISTERED ENGINEERS) WITH DUE CONSIDERATION TO THE MANUFACTURERS INSTRUCTIONS. Procombi 100e start, no ignition, then red light - replace ignition pcb board. Vaillant EcoTec Pro leaking - replace aav, pump up expansion vessel. Ariston 24mffi leaking - replaced diverter valve. Worcester Junior 28i losing pressure - replace PRV and repressurise expansion vessel. Potterton Kingfisher Clicking - replace pcb. Jaguar 28, F3, Pressure rising to above 3 BAR - replace hot water heat exchanger and pump up expansion vessel to 0.75 BAR. Worcester 24i junior - leaking, no pressure indication - replace air admittance valve, fit new pressure gauge, pump up expansion vessel. Potterton Suprima 50L red lights stays on - replaced pcb, thermister and stat. Potterton Suprima no ignition - Unblocked pressure pipe to fan motor. Worcester Bosch 30CDi SE light Flashing - Serviced Boiler, Fitted Magnaclean. Potterton Puma, hot water ok, but no central heating - replaced heat sensor and main pcb. Alpha 28CB, no hot water, leaking then stopped altogether - replaced fan motor, heat exchanger and flow switch. Protherm 80E , cutting out on hot water and F1 error - Replaced DHW Heat Exchanger. Worcester Bosch 28i no ignition - Replaced Fan Motor. Main Medway - No full ignition - freed and lubricated spindle pin. Bosch washing machine overfilling, stopping - unblocked pressure chamber and replaced heater. Bosch Washing Machine Stuck on Rinse – Replaced Fill Valve. Bosch Washing Machine Not Spinning – Replaced Motor Brushes. Beko Washing Machine Very Noisey – Removed Transit Brackets. Hotpoint Washing Machine Not Washing – Hot Tap not connected. Maytag Washing Machine Not Spinning – Clutch refitted to motor. Hoover Washing Machine Not Draining – Replaced Pump. Bosch Washer dryer – Dryer Performance suspect – Cleanned fluff from condenser. Bosch Washing Machine Not Pumping - Removed safety pin from pump. Hotpoint Washing Machine door came off - Fitted new hinge. Hotpoint WT540 washing machine not draining - remove coins from pump. Hotpoint Condenser Tumble Dryer Noisey - Replaced Rear Fan. Hotpoint Tumble Dryer Not Heating – Replaced Stats. Hotpoint Tumble Dryer Not Spinning – Replaced Pulley. Zanussi Tumble Dryer not spinning – Replaced Belt. Hoover Dishwasher leaking from bottom - flashing display - hose to heater adrift, refitted and test. Indesit Dishwasher not pumping - removed match jammed in pump. Bosch Built in Dishwasher not starting - replaced motor seal kit. Whirlpool Dishwasher poor wash - replaced wash pump. Hotpoint Dishwasher Dispenser Not openning program erratic – Replaced Module. Bosch Dishwasher Stuck with Water – Removed Blockage from Pump. Whirlpool Dishwasher Overfilling – Replaced Valve. 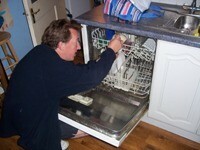 John Lewis Integrated Dishwasher Installed. Bosch Dishwasher Not getting hot – Replaced Heater. Bosch Dishwasher Leaking - Found drain hose leaking, cut hose down and rejoinned direct to metering tank. Kenwood Dishwasher Leaking - Found damaged drain hose repaired. Hotpoint UY46X lower oven not working - replace element. Bosch Cooker Hood dead - replaced pcb. John Lewis Electric Hob – installed. Indesit Built in Oven installed. Admiral VI Fridge Freezer ice build up in base of freezer - unblocked drain hole, and removed ice. Fridgemaster Fridge Freezer, fridge warm – replacement compressor needed. Neff integrated Fridge – installed. Neff integrated Freezer – installed. Indesit Fridge Freezer – installed. Daewoo Fridge Freezer - fridge not working, defrosted ice build up in freezer. No hot water from cylinder - drain system and fit 3 port honeywell valve. Toilet Leaking from isolation valve - replaced valve, pipework to torbeck ball valve. Radiator Valve Leaking - Sealed and tightenned. No hot water from kitchen Tap - Replaced Tap. Toilet leaking -replaced fill valve. Radiators not hot - bled radiator. Aqualisa Shower stuck on hot - replaced cartridge. Leaking from overflow - replaced float valve. Poor Circulation in Heating - added cleaner, fitted magnaclean, drainned and refilled with inhibitor. Site maintained by Ian Foster - any comments or suggestions please let me know. Thank you. Baxi Boiler Service,Vaillant Boiler Service, Alpha Boiler Service, Ideal Boiler Service, Glow worm Boiler Service. We can supply and fit a thermostat to control through the internet, iphone, windows phone, android phone. Save upto 31% on your heating costs! !